Benjamin “Lee” Klein was born on January 3rd, 1981, in the same week as Elvis, only 46 years later. Growing up as the only child of musical parents, he has been singing, dancing and acting all his life. Through the years he also learned to play drums, bass guitar, piano and acoustic guitar. In 2002, he bought a 50’s Elvis CD for his Dad Randy, who was an Elvis tribute artist before Ben was born. Then realizing his own resemblance to the young Elvis, Ben borrowed the CD, found movies and videos and decided to listen, watch, study and practice. 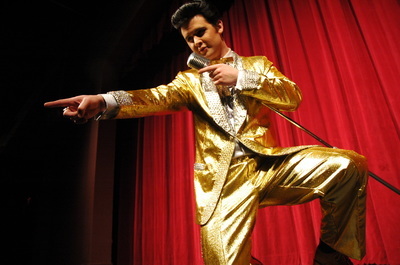 In 2011 he was runner up in the Ultimate Elvis Contest sponsored by Elvis Presley Enterprises and is considered top 5 in the world for Elvis Tributes. Not only can Ben Sing and perform just like Elvis, he also transforms into other famous artists including Michael Buble, Dean Martin, Frank Sinatra and Nat King Cole. Hear songs like “Come Fly With Me” and “Fly Me To The Moon” by Sinatra, “Love” by Nat King Cole, “Ain’t That a Kick In The Head” by Dean Martin and “My Baby Just Cares For Me” and “You Make Me Feel So Young” in the version done by Michael Buble. Ben has the looks, the voice, the moves and more! See Ben perform at the Front Entrance of the Zoomershow each morning, just prior to the doors opening for the day.